Panorama of the night sky and the Milky Way taken on Sept. 27, 2014, from the international Space Station. In 2018, scientists confirmed a theory by observing stars in the Milky Way. Lake Effect's Bonnie North speaks with astronomy contributor Jean Creighton about the top astronomical discoveries of 2018. In 2018, scientists from LIGO (Laser Interferometer Gravitational-Wave Observatory) confirmed their observation of two neutron stars colliding. The event took place 130 million years ago. "This epic event not only helped us find something we were anticipating — that when neutron stars collided they would create so much energy that they would send ripples through spacetime (we call them gravitational waves) — [it also] confirm[ed] some of the expectations that these gravitational waves do travel at the speed of light." Creighton explains that "from one day to the next," scientists were able to confirm the speed of light to within 1/10^15 of accuracy. She continues, "And, just to put a cherry on cake: this is how gold is made. We finally figured out that the collisions of neutron stars are what makes some of the heavy elements in the periodic table ... One of these collisions makes 10 times the mass of earth in gold." Artist’s annotation of S2 passing supermassive black hole at center of Milky Way, confirming gravitational red shift. 2. Observation confirms Einstein's theory of relativity near supermassive black hole. For the first time, scientists were able to test and confirm Einstein's general relativity by observing stars near the center of our galaxy, the Milky Way. 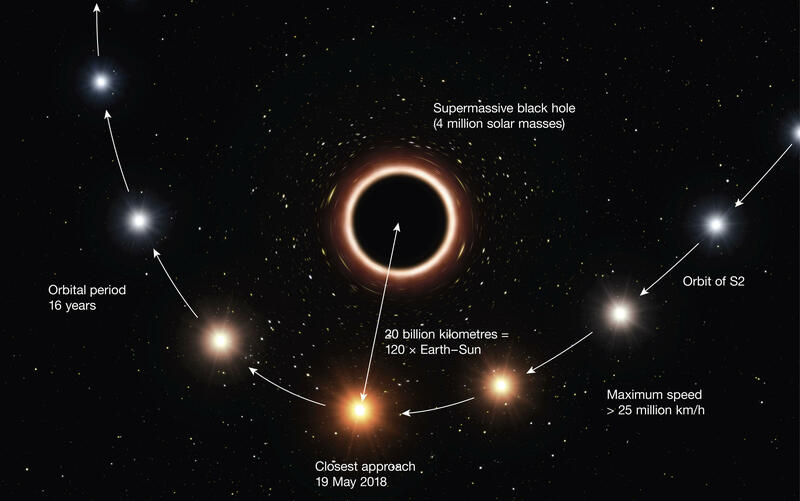 "One of these stars — S2 or SO2, depending on the researcher — got within 20 billion kilometers [of the black hole], which sounds like a long way but actually is very close," Creighton explains. She continues, "This was a really special opportunity, and it's interesting that two groups have spent 20 years of their careers to try and just follow these stars and their movements ... the hard data." While this satellite isn't the first to survey exoplanets, TESS has upped the ante with its ability to scan the universe, looking for previously unknown exoplanets. "TESS is a new kid on the block ... that's following, basically, 100,000 stars every 30 minutes. So, we see any little blip, any little change, and if it's periodic we can say, 'Oh! There's a planet going around that star ... So, we're expecting to find 10,000 new exoplanets," says Creighton. Our ability to observe exoplanets in general, is relatively new. Creighton explains, "25 years ago, we thought there were exoplanets but we had no proof. And now they're just coming out of our ears, we just don't know what to do with them." The Hayabusa2 is an asteroid sample-return mission that is operated by JAXA (Japanese Aerospace Exploration Agency). Like its predecessor Hayabusa, Hayabusa2 landed on an asteroid to send materials back to earth for analysis. Creighton says, "We've done missions like this before, but this seems to be more promising in the sense that we'll get a little more material and we're a little more sophisticated in how we're going to protect it from getting contaminated. So, we're going to be able to see what is the chemistry of an asteroid, and asteroids are our prime building materials for planets."